Love poetry? Love somebody? Love LOVE? ... or just need a one-of-a-kind gift for Valentine's Day or another occasion? Let the poets of Typewriter Rodeo write you a poem, right on the spot, typed by hand on their vintage typewriters at Interabang Books. 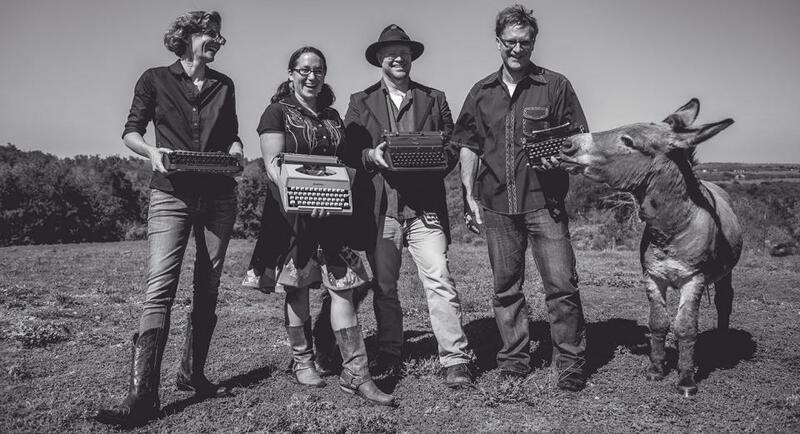 At our event, we will also have for sale TYPEWRITER RODEO: THE BOOK, which tells the real stories of people across the country, from Texas teachers to Maine lobstermen, through the original poems hand-typed for them on-the-spot. We encourage picking up a copy of TYPEWRITER RODEO: THE BOOK when you line up for your poem. * In particular, if you're giving your poem to a loved one as a gift, you'll find there is no better way to show just how special their one-of-a-kind lines of verse are. Filled with poetic portraits of love and longing, whimsy and wonder, healing and hope, the book also shows how we still need genuine connection — to be seen and understood. And that we’re all in this beautifully messy thing together. *Here's how the event will run: To manage the demand for a personalized poem, to join the line to meet and confer with a poet requires a sales receipt from Interabang from the day of the event. Buy any book, any gift item, any card, anything at all ... although we (and they) will love it if you buy their book TYPEWRITER RODEO. At times when there is no line, no proof of purchase is required.